The conference was organised by the Institution of Mechanical Engineers (IMechE), one of the world's leading professional engineering institutions. 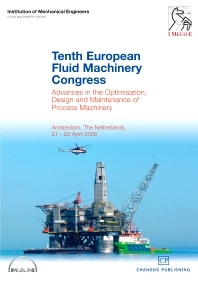 Advances in exploration and process technology have led to increasing pressure and temperature challenges for fluid machinery. Designers must also address the stringent limits on the weight and volume of product equipment. This conference showcases the latest technology and provides a forum for sharing valuable design and operating experiences. Papers cover the following areas: Equipment and systems design; Operations and maintenance; Compliance with legislation; Processing; Equipment and drives.